On Saturday 11 January, 75 AAA activists met in the Teachers Club in Dublin for a national meeting to discuss the economic situation and to discuss how the AAA can prepare for the local elections in just over four months time. Lecturer and ‘Sins of the Father’ author, Conor McCabe, and Paul Murphy MEP gave introductions explaining how the crisis unfolded and how the crisis was used to protect the wealthiest sections of society by shifting enormous sums of wealth from working class people to the mega rich. Both speakers explained that austerity wasn’t just a policy to deal with a crisis situation, but rather a weapon to achieve that transfer of wealth and would be used by the ruling class for the foreseeable future. Undoubtedly everyone will sigh with relief with the hope that the worst is behind us, and some may even think that, well, austerity worked! But the talk of recovery can also provide a real basis for the demand to ‘lift the burden now’ – to really end austerity now that we have signs of recovery. This means that the message of the AAA can get a real echo from all those who’ve suffered over the past six years. Water charges and metering will be a major issue this year. 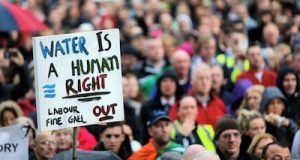 The AAA in various parts of the country has been the only group to seriously organise meetings and protests against the installation of water meters. Unfortunately they haven’t managed to be of a significant size to stop metering. However, the main battle is not against water metering but against water charges. Households will be metered for the last three months of this year and the first bills will arrive in January 2015. While the government haven’t announced how water charges will be collected, it is possible that Revenue will not be involved – a fact that made the fight against the property tax very difficult. This means that a mass non-payment campaign could be possible. But rather than waiting for bills to arrive, the AAA is fielding over 40 candidates in May’s local elections to give people a chance to deal an important blow to water charges and austerity. AAA candidates will be standing throughout Dublin, in Cork, Galway, Drogheda, Kilkenny, Limerick and Shannon, Donegal and Carlow. 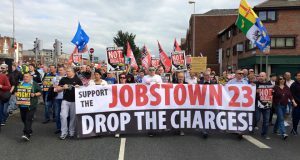 In all these areas, activists are building local groups to prepare for these elections, encouraging all those who are sick and tired of austerity to get active and help elect a host of anti-home tax campaigners, sending a clear message to the political establishment that we’ve had enough. The basis for this is increased by recent scandals involving Irish Water. Incredibly, Irish Water have spent over €50 million in so-called ‘consultancy fees’. These include IBM, Ernst & Young, Accenture and Oracle on information technology, billing and customer service as well as financial and asset management systems. Two of Irish Water’s senior executives – head of asset management Jerry Grant and head of corporate services Elizabeth Arnett – had previously worked for RPS – the consultancy firm behind the ill-fated Poolbeg incinerator project which racked up €95 million costs for the tax payer. This revelation was preceded by the announcement by Irish Water that if people don’t use enough water, the price will have to go up! These scandals explode the myth that the setting up of Irish Water and the introduction of water charges is about securing supply or saving water. It shows Irish Water will follow the same path of other privatised state assets when multi-national companies get their hands on them. They will be turned into for-profit enterprises where big companies can tap hard-pressed families for extra taxes. This also indicates how important it is for a real credible political alternative to be built. The first step is to campaign for the election of a host of anti-austerity, anti-water tax candidates across the country in May. The conclusion of the meeting in the Teachers’ Club was for all activists to go back to their areas and to step up the campaign for May’s local elections.